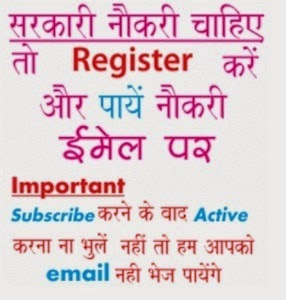 Our blog is all about sarkari naukri 2019 hindi, with latest results, exam dates, admit card, school college admission merit list etc. This programme was telecast live on Doordarshan DD National and DD News from 10.00 am onwards. The Minister of Health & Family Welfare Dr. Harshvardhan, Minister of Micro, Small, Medium Enterprises (MSME) Shri Kalraj Mishra and many others important personalities will be present to take forward the initiates of Union Labour Ministry for the purpose of Make in India. Updates (16/10/2014): Under Apprentices Act 1961 the seats are going to increase from 5 lac to 23 lac and stiffen is also increased. As per information there are 35 State Government Labour, Health, Vocational Training Ministers, 60 State Government secretaries and 64 CEO from various Public Sector Undertakings (PSUs) are attending this conference. Disclaimer: - This is not official website, Our Website Sarkari Naukri is for information purpose, we cannot guarantee that information is 100% accurate. For complete details visit institute/organization website or prospectus. However, we cannot guarantee that information will always be up-to date. If you see something in a webpage that needs correction or updation, please contact us. And in no way sarkarinaukriwebsite.in will be liable for any losses & damages arises from its contents/text.